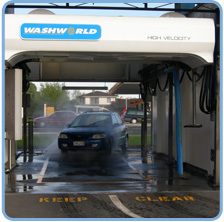 At Washworld Wairau we have a Hi-Velocity Touch-Free Automatic Wash.
Offering you a range of wash options starting from as little as $8. triple-colour conditioner, clear coat protectant and dryer. automatic entry system on site. The entry system accepts notes and coins.